Well, sometimes pictures speak louder than words but I have to share just how absolutely, completely and totally proud we are of D for today. It was Sports Day, something that had occupied her last thoughts at night and her first thoughts in the morning. She was worried about the change of routine and that she wouldn’t win a medal. 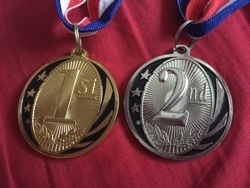 School emphasise the “it’s not the winning but the taking part” but, that’s all forgotten when you have classes of children who just want a medal – and preferably a gold one. This morning was individual field events, always fun to watch as the groups go around doing boccia, kurling, javelin, football skills etc. D joined in when it was her go but clung to me like a limpet and said she definitely did not want to take part in the final event – house tug of war. But when it came to it, she took part. We both did. Which was really good fun and her house group went into the final game in the lead! All was going well, children and adults pulling and pulling and getting that scarf past the mark until ….. the rope broke. The first time that has ever happened and everyone who had been pulling tumbled down like skittles. It surprised everyone (to say the least) and some children laughed but most were a tad shocked to have suddenly fallen. D was at first extremely cross and determined she didn’t want to talk about it and definitely didn’t want to tell Hubbie about it (and I wasn’t to tell him either) but, in true D fashion, it was one of the first things she told him this afternoon! This afternoon, where do I start? It was extremely warm and those pesky anxieties came back for D. There were moans and refusals and a LOT of coaxing needed to get her to the start line (and then dashing to the finish so I could be there to cheer her on). When D runs, she runs as if she is focused on one thing and runs straight for it. Me, jumping around and encouraging her at the end. (Very, very cropped so as not to include any other children). Well done D! D ran in her two relay heats so fast that her team who had previously been in 3rd were now in 1st, even the commentator mentioned how fast she was. One medal became two! After that, the tiredness and emotion really set in and (proud though she was), she’d had enough. Not wanting to sit with her class, it was a case of keeping her calm and preventing a bolt until it was all done and dusted. Later on at home, when she was calm and comfortable, I asked her what she’d been thinking about when she was running as her emotions changed so suddenly from worry to determination. She replied “I wanted to win” and that was that. The last race of the day btw is parents and staff relay, in house groups, it’s always a time when teachers and TAs forget what they tell the children – it’s not the winning but the taking part – and the determination is very, very evident. Even D was amazed at how fast the staff were running and remarked that they “weren’t careful with the obstacles”. Really, really good fun and what a result for D in her last Primary sports day. Silly Mummy on 24th June 2015 at 9:59 am. Jeannette on 8th December 2015 at 12:06 pm. Thanks, the tug of war was something she still laughs about, if prompted. Great fun! Caroline on 25th June 2015 at 2:54 pm. Jane - Our Little Escapades on 30th June 2015 at 7:58 pm. Jeannette on 8th December 2015 at 12:05 pm. Thanks, next year’s will be very different (and potentially angst-filled) as she’ll be going from one of the tallest/strongest in primary to a little secondary pupil! We shall see!